Over one hundred patients, healthcare workers and politicians across the UK and Ireland have come together on World Chronic Obstructive Pulmonary Disease (COPD) day to launch an integrated project to tackle the killer disease which claims over 600,000 lives in the EU every year. €7.7m has been awarded by the Special EU Programmes Body (SEUPB), responsible for managing the EU’s INTERREG VA Programme, for a pioneering cross-border research project designed to better understand and alleviate the impact of this killer lung disease. The project known as ‘BREATH’ (Border and REgions Airways Training Hub), launched today (15 November) in Dundalk, involves experts from Queen’s, the Dundalk Institute of Technology (DkIT) and University of the West of Scotland. COPD is now the third biggest killer in the UK. Although smoking and air pollution remain the key contributing factors, genetic influences and early life events including infection, poor nutrition and impaired lung growth are now considered important factors responsible for COPD. Urban areas of Northern Ireland, Dundalk and West Scotland are considered ‘hotspots’ where the prevalence of COPD cases is up to 62% higher than the national average and as such, are represented by the regions taking part in this project. She added: “In addition to having a staggering impact on the quality of life of sufferers, COPD exerts a huge economic burden on society and costs the EU over €380bn every year. 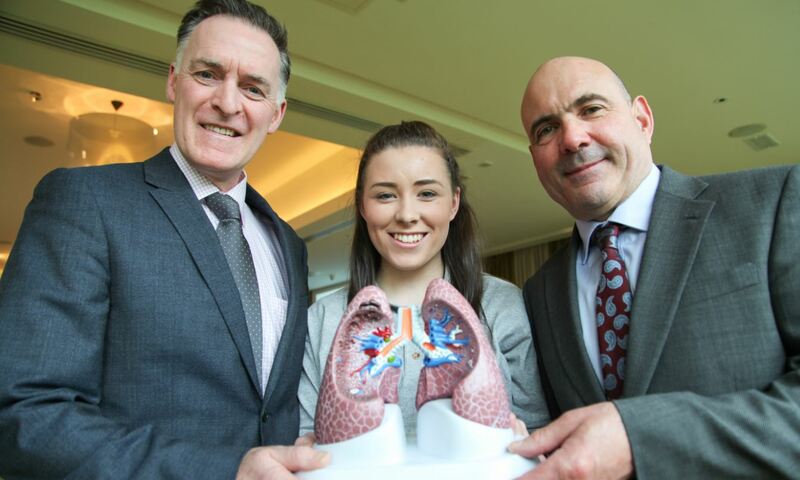 Caption: (L-R) Dr Lorcan McGarvey, PhD student Nicola Roe and Dr Keith Thornbury of the Smooth Muscle Research Centre at Dundalk Institute of Technology pictured at the BREATH Project launch in the Ballymascanlon Hotel, Dundalk, County Louth.